West Virginia’s traditional buck firearms season will start Monday, Nov. 20, 2017, and run through Dec. 2. Hunters should see plenty of deer this year due to the season opening close to the “rut,” or, mating season. November firearms deer season traditionally opens the Monday before Thanksgiving, so the season can start as early as Nov. 19 and as late as Nov. 25. The timing of firearms season is a balance between hunting part of the “rut” while still allowing for the annual renewal of the deer herd. “Hunters should enjoy a great deer season in 2017,” said Gary Foster, assistant chief in charge of wildlife management for the West Virginia Division of Natural Resources. “West Virginia’s deer seasons provide quality outdoor recreation for hunters and at the same time boosts the state’s economy by millions of dollars. Resident hunters wanting the opportunity to harvest an additional buck must purchase the Class RG stamp before the beginning of the season. The cost is $21. The RG stamp must be accompanied by a Class A and CS, A-L, AB-L, X, XS, XJ, AH, AHJ or free license. Resident landowners have the privilege of harvesting an extra buck without purchasing the RG stamp, if they are hunting on their own property. Nonresident hunters wanting the extra buck must purchase a RRG stamp before the beginning of the season for $43. The RRG stamp must be accompanied by the Class E, AAH, AAHJ or XXJ license. Nonresident hunters who own land in West Virginia are not exempt from purchasing a license or the extra buck stamp, even if hunting on their own property. Hunters in 23 counties are required to take an antlerless deer with a firearm (required Class N permit for residents or Class NN permit for nonresidents) before harvesting a second antlered deer during the buck firearms season. Most counties are open to concurrent antlerless deer season hunting during the traditional buck gun season. Class N or Class NN permits, which are required to hunt during the antlerless deer season, can be purchased at any time. Antlerless deer firearms season opens Nov. 20 on private land and selected public lands. Hunters should consult the 2017–2018 Hunting and Trapping Regulations available at license agents for specific antlerless deer regulations in each county and wildlife management area. Small game hunting, including bobcats, is prohibited during the first three days of buck firearms season in all counties having a buck firearms season. Archery and crossbow hunting for antlered and antlerless deer is legal during the buck firearms season subject to all archery and crossbow deer hunting regulations. 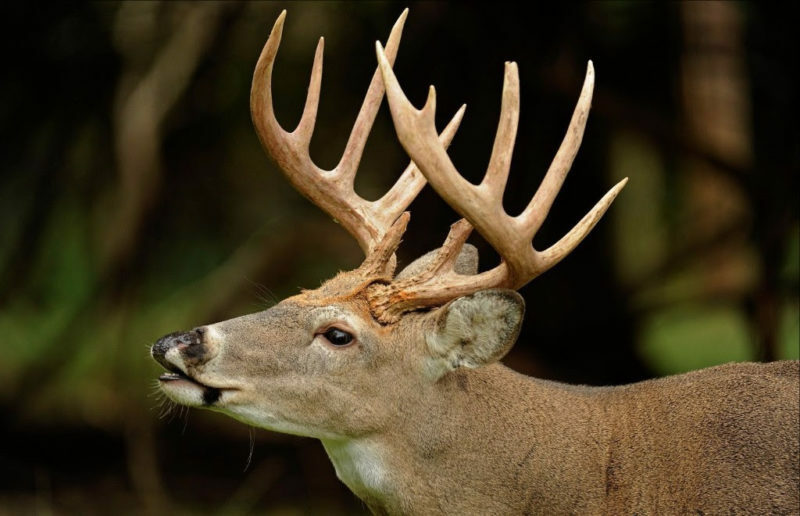 Hunters may harvest two deer on the same day, but only one of those can be an antlered buck. The first deer does not have to be legally checked before harvesting the second deer in the same day. However, all deer must be checked and the checking confirmation number recorded by the hunter before hunting during any subsequent day. Hunters are required to use their permanent DNR identification number when checking their game. This may be done from a phone at 1-844-WVCHECK, a computer at wvhunt.com or at a hunting and fishing license agent. For a list of license agents visit www.wvdnr.gov.